As any seamstress knows a pincushion is your friend. I own many types of pin cushions and have made pin cushions but recently when I was cleaning out a drawer I found a pin cushion that a friend brought me many years ago. 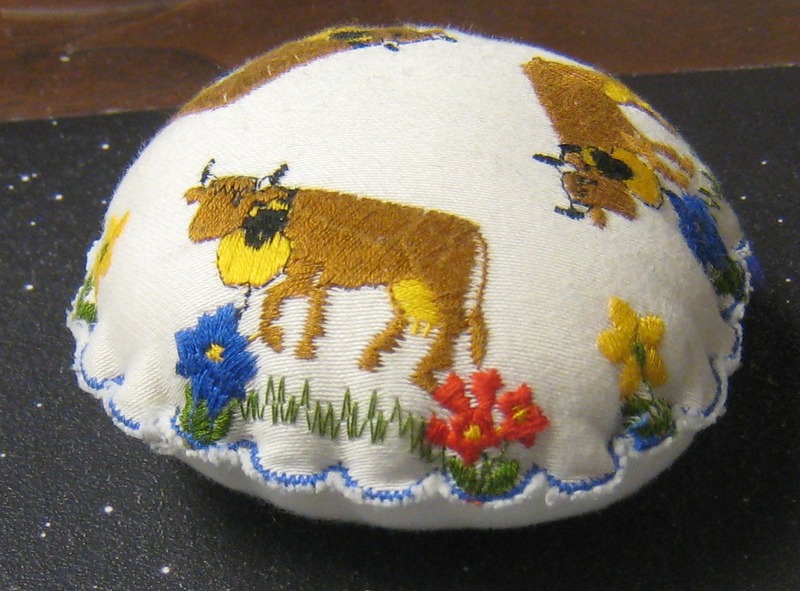 She had traveled to Switzerland to visit with relatives that were temporarily living there and brought me back this wonderful pin cushion. As I’ve mentioned before I struggle to use special things and for many years have put them aside for safe keeping. One of my recent decisions however is to live life with intention. One of my intentions is to cherish these special items but also to use them so I can get pleasure out of them every day. This pin cushion sits on my sewing table and holds threaded hand sewing needles. Although I don’t do a lot of hand sewing there are always finishing touches that require a needle and thread. So Sarah, every time I use this pin cushion I think of you and am thankful for your years of friendship. What a gift! So specia,l and even more precious becasue it is being used!